The city government of Tijuana announced Saturday that it has closed down a migrant shelter at a sports complex close to the U.S. border that once held about 6,000 Central Americans who hope to get into the U.S.
Officials said all the migrants were being moved to a former concert venue much farther from the border. The city said in a statement the sports complex shelter was closed because of "bad sanitary conditions." Experts had expressed concerns about unsanitary conditions that had developed at the partly flooded sports complex, where the migrants had been packed into a space adequate for half their numbers. Mud, lice infestations and respiratory infections were rampant. The remaining migrants were taken by bus to the new shelter about 10 miles (15 kilometers) from the border crossing at Otay Mesa and 14 miles (22 kilometers) from San Ysidro, near where people line up to file applications for asylum in the United States. 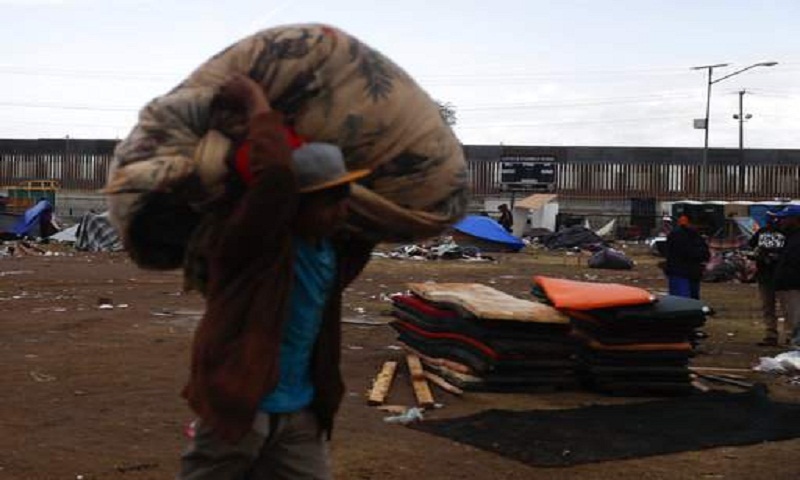 Tijuana officials had said earlier that nobody would be forced to move to the new facility, a large building and concrete patio known as El Barretal that was used for concerts and other events until about six years ago. But they also warned they would stop offering food and medical services at the Benito Juarez sports complex. The new shelter is being run by federal authorities. Also Saturday, in one of his first acts in office, Mexican President Andres Manuel Lopez Obrador signed an agreement with his counterparts from three Central American countries to establish a development plan to stem the flow of migrants seeking asylum in the U.S. The Foreign Ministry said the plan, which includes a fund to generate jobs in the region, aims to attack the structural causes of migration from El Salvador, Guatemala and Honduras. Thousands of migrants, mostly Hondurans, have joined caravans in recent weeks in an effort to speed across Mexico to request refuge at the U.S. border. Dozens of migrants interviewed by The Associated Press have said they are fleeing poverty and violence in their countries of origin.